Are you interested in identifying fungi, photographing fungi, or just learning about the amazing Fungi Kingdom? The Hobart Fungal Studies Group (HFSG) meets for forays monthly, and you are welcome to come along. This group was formed in 2012 by Nell Hilliard, the stimulus for this being the Fungimap Conference held in Hobart and Corinna in May, where some of us met up for the very first time. You may like to be included in the group mailing list where last minute changes are announced, as locations can change because of dry or wet weather. Numbers are limited because of the nature of the group and the sensitive areas we visit. 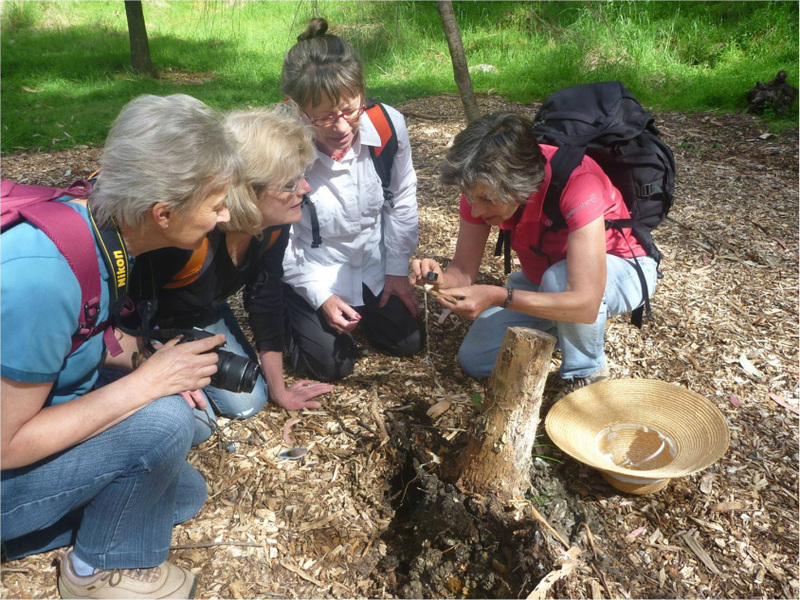 A motion was passed on Thursday 5th September for the Club to fund the Publication of "A Field Guide to Tasmanian Fungi" by club members Drs Genevieve Gates and David Ratkowsky. The expected release date for the book is March 2014. 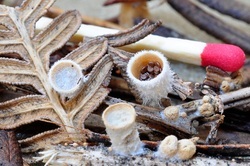 These fascinating fungi consist of an urn or vase shaped cup approx 5-15mm wide by 4-8mm high and contain disc shaped peridioles which resemble tiny eggs. Peridioles are capsules which contain the fungal spores. The young fruiting bodies are initially covered by a thin membrane to protect the peridioles until maturity. When rain splashes into the cup the peridioles are dispersed, often quite far from the source. The peridioles on some species have a sticky trailing thread that enables them to attach to twigs or plants. Bird's Nest Fungi belong to the order Nidulariaceae and were first mentioned by the Flemish botanist Carolus Clusius in 1601. For centuries peridioles were the subject of much controversy regarding whether they might have been plant seeds and also their method of dispersal. The fact that the peridioles are ejected by the force of rain drops on the cups was confirmed in the 1940's by Dr Harold Brodie. There are 5 genera within the family, Cyathus, Nidula, Nidularia, Crucibulum and Mycocalia. They are distinguished from each other by differences in morphology and peridiole structure eg Cyathus has black peridioles while those of Nidularia and Nidula are brown. The fungi grow in groups and obtain nutrition from decomposing wood and plant matter, they are found in most regions but are usually overlooked due to their small size. Sometimes peridioles are eaten by animals and large colonies of fungi can be found growing on old cow pats or weathered horse dung. The photo shows some Nidula cf emodensis which were found in July 2012 on fern frond litter at Peter Murrell Reserve, Kingston, Tasmania. Participants: Elizabeth Bicevskis (author), Annabel Carle, Geoff Carle, Genevieve Gates, Carolyn Hall-Jones and Margaret Warren. Wearing full wet weather gear we gathered on a cold windy morning at Bus Stop 3, Strickland Avenue South Hobart. There had been another night of soaking rain and fresh snowfalls on Mt. Wellington and morning showers were forecast. The plan was to survey an unmarked track starting opposite Bus Stop 35 and the southern end of the Middle Island Fire Trail (MIFT). The northern-most end of the MIFT, entered from Old Farm Road had been surveyed the previous Monday. Ahead was a gradual climb on a muddy track up a ridge through wet sclerophyll forest. The dominant eucalypts were Eucalyptus globulus (Tasmanian Blue gum), and Eucalyptus obliqua (Stringybark). The open canopy allowed development of a scrubby understorey of Bedfordia salicina (Tasmanian Blanket Bush), Coprosma quadrifida (Prickly Currant Bush), Olearia argophylla (Musk Daisybush), Pomaderris apetala (Common Dogwood), and Zieria arborescens (Stinkwood). On the unmarked track we passed many small troops of Coprinellus disseminatus, the emerging caps creamy yellow becoming grey when expanded. Anthracophyllum archeri was in abundance, colonising dead branches and twigs beside the track. 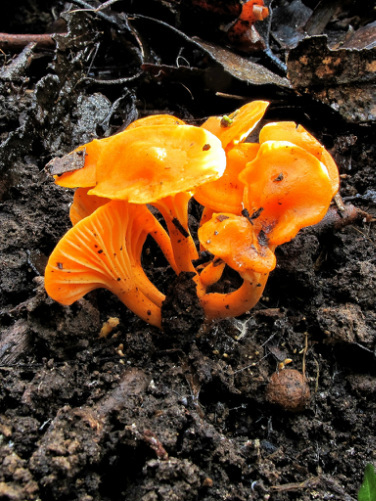 A bright orange group of Cantharellus concinnus appearing late in the season shone through the bush, while nearby was Mycena kurramulla with pink cap and arched decurrent gills with pink edging, as well as Pholiota multicingulata with a large mature cap marked faintly with scales and a dark red stipe. There were many LBF (little brown fungi), some of which we were surprised to learn were Cortinarius sp., including one specimen with a dark brown and very prominent umbo. The wind blew strongly through the tree tops and a noisy flock of Sulphur-crested Cockatoos passed overhead. Arriving at the MIFT we were concerned to see many tall stands of flowering Erica lusitanica (Spanish Heath) invading the native vegetation. Spanish Heath is a declared weed in Tasmania. We walked north along the MIFT to its junction with the Inglewood Fire Trail and stopped for morning tea under a Blue Gum. Above head height on the trunk of this large tree was a single small brownish yellow cap with similar coloured gills and little or no stipe. This was identified as Crepidotus eucalyptorum. We were excited to learn that this was only the second time this species had been identified on Mt. Wellington. Under a Stringybark nearby in damp litter was a single Leotia lubrica and three young Cortinarius rotundisporus with deep indigo-blue viscid caps and pale lilac gills. During our return to Bus Stop 35, an Entoloma sp. with dark shiny stipe, basal tomentum and pink flushed gills was observed growing on disturbed ground. Nearby, an extensive colony of Marasmiellus affixus was growing on the trunk of a large Stringybark. The distinctive creamy discolouration caused by mycelium prior to the appearance of fruit bodies was present. A small fungus with a big smell! Fungi with simple gills: Anthracophyllum archeri, Cantharellus concinnus, Clitocybe clitocyboides, Collybia eucalyptorum, Coprinellus disseminatus, Cortinarius rotundisporus, Crepidotus eucalyptorum, Entoloma sp., Galerina patagonica, Gymnopilus sp., Hypholoma fasciculare, Inocybe sp., Laccaria sp., Lactarius eucalypti, Marasmiellus affixus, Melanotus hepatochrous, Mycena carmeliana, Mycena kurramulla, Panellus stipticus, Pholiota multicingulata. Spine fungi: Hydnum repandum, Steccherinum sp. Bisporella citrina, Chlorociboria aeruginascens, Daldinia grandis, Leotia lubrica, Urnula campylospora. A total of thirty four species were recorded on the day and of these six were Fungimap Target Species: Anthracophyllum archeri, Cortinarius rotundisporus, Hydnum repandum, Leotia lubrica, Tremella fuciformis, Urnula campylospora.